Portable speakers are becoming an increasingly popular promotional product due to their practicality and high perceived value. These custom mini speakers are sure to delight your customers as a gift with purchase. User-friendly: These custom Bluetooth speakers are clearly very simple to use, with one button to turn on and pair to your device. This ensures that people of all ages will be able to use this product. A gift with purchase should always have a broad appeal as it will be received by such a large and diverse audience. Fun design: The speakers come in numerous different styles. Pictured, we see the custom mini speakers in a glossy black design as well as a bright animal print option. While these designs are certainly eye-catching, it is important to ensure that any customer would want this product, as mentioned before. Convenient: Practicality is of key importance here. 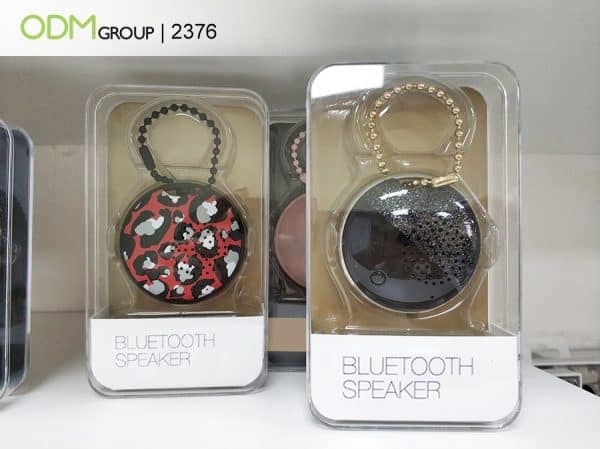 With a Bluetooth speaker on your keychain, you’ll be able to play music virtually anywhere you go. 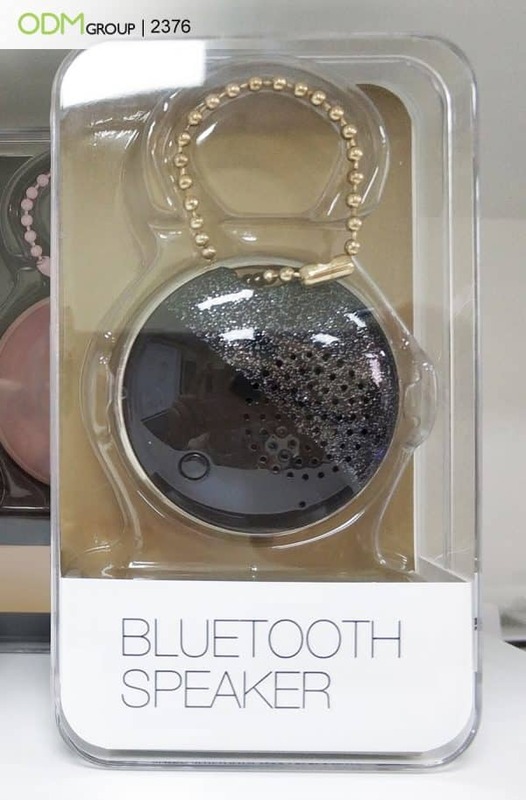 This item is the perfect way to liven up picnics, parties or just to enjoy your favourite tunes around the house. Simple: The promotional speaker can be charged with any micro USB cord, so you don’t need to remember to carry around specific cords for it. Relevant: More people are using Bluetooth speakers than ever before. Customers will go out of their way to receive these trendy custom mini speakers. Customisable: While great as is, branding the packaging with your logo will make this gift even more valuable for your business. This increases brand value and image. Why offer your customers a gift with purchase? Adds value: Customers are always going to prefer a product which offers them a gift over alternative options. While the items are often cheap to source or produce, they add substantial value to your products. Stands out: Whether the offer is advertised on the product’s packaging or is given along with it, a complimentary gift with purchase gives you the advantage ahead of competing brands. Improves loyalty: Customers value the effort which go into a marketing giveaway. This often translates into brand loyalty, resulting in consistent purchases for years to come. These functional and stylish custom mini speakers will catch the attention of shoppers and set your product above from the rest. ODM are experts in developing and manufacturing marketing products and merchandise. We’re here to help every step of the way – reach out today! Interested in this product? Just quote code: 2376. This fun speaker would be a great corporate gift – practical and eye-catching! The simple design of these portable speakers make them ideal for branding with your logo. Believe it or not, this Bluetooth speaker doubles as a frisbee. Giving these away during a summertime promotion would leave a lasting impression! This multi-functional product would be a great match for a sporting goods brand. A waterproof speaker is useful for a range of outdoor activities, especially hikes and days at the beach.